This will be one of many posts where I'll recommend some anime that I loved to watch for different reasons and I'll show them to you so you can see new cool anime or comment if you already saw. Here's two japanese animations that I saw some time ago and loved it. Mai Tokiha and her sickly brother Takumi recieved a scholarship to be transfered to the prestigious Fuuka Academy. On the way, the ferry where they were traveling turned into a battlefield between two girls with superpowers and while trying to escape, Mai learned that she has special powers too. The blue hair girl, who was preying the other girl, when realized that Mai had powers to, warned her to stay away from Fuuka Academy or she will die. discovered, their destiny is uncover and the true battle begins. Fight! if they lose, the most important thing in their live is lost forever. But in the end, only one HIME must stand alive. What i'll they chose? Fight and protect what's more important in their lives, or refuse to fight and lose what they love the most? Sacrifice a dear friend loved one to protect her own? And if the important thing is shared by both HIMEs and it's meant to die? "Fuuka Academy - The golden cage of 12 Princesses that aren't allowed to love"
Mahoro is an android created by VESPER, an highly secret organization, to fight an alien invasion by Saint. Being an android, she has a limited life span, having just 398 remaining days to live, and VESPER gives her the choice to do anything she wants. 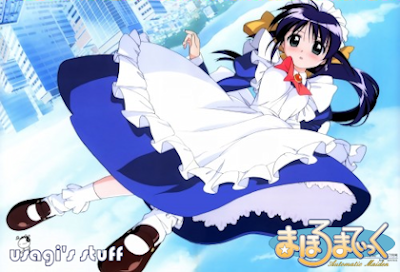 She chooses to become a maid for Suguru Misato, and why? Because she was forced to kill his father who was her superior commander, when he was took hostage by an alien that was bersek. And this way was the least she could do to make up for it. 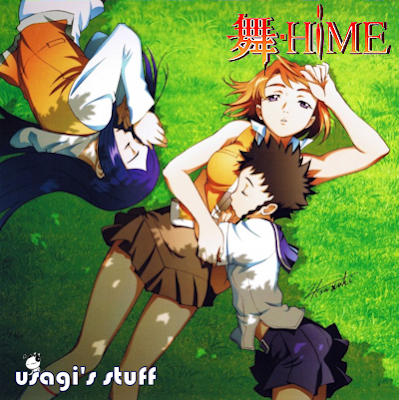 While living with Suguru, Mahoro and Suguru live the happier days of their live along with their friends and their (extremely perverted) teacher, although Suguru doesn't know that she killed her father. What'll happen if Suguru knows who killed is father, his only family? Will she be forgiven before she dies?